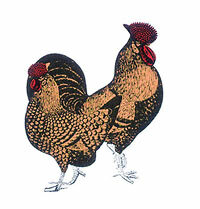 This Old English Breed with reddish brown feathers tipped with black spangles has a large rose comb covered with prominent points. They are white skinned & lay tinted eggs. Chicks are a light reddish tan with black speckles and some stripes.